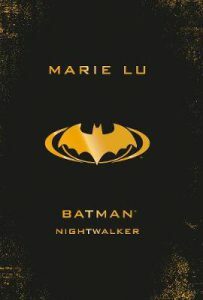 Batman Nightwalker by Marie Lu is the second in the DC Icon superhero series! 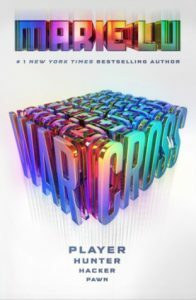 I really love what these authors are doing with this books…they’re all famous and amazing YA authors who are each taking a turn writing a teenage-centric story about our favourite DC superheroes origins stories. And since Batman is one of my favourite ever heroes, I was really excited to see what Marie Lu would do! 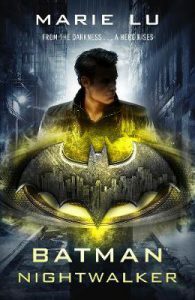 I was a bit surprised it wasn’t more focused on Batman himself, but this is about the world’s most famous teenage billionaire: Bruce Wayne. The story basically begins with Bruce accidentally getting involved in a highspeed car chase to catch a criminal. Only problem is: he’s a civilian and absolutely not supposed to do that. He’s charged with preventing justice and has to serve community service. Bruce is a little disenchanted with life at the moment, feeling lost now that he’s officially 18 and has come into his fortune and misses his parents a lot. He wants the world they envisioned but he doesn’t know how to get there. (Basically he has a total heart of gold.) Then he gets stuffed into Arkham Asylum to serve his community service…as a janitor. But it’s there that he meets Madeline, member of the infamous Nightwalker murderer gang. They target billionaires and Bruce could very well be next on their list. The story is definitely pre-Batman, so it wasn’t a nod to Christopher Nolan’s Dark Knight trilogy — but more a story woven all it’s own. It has references to everyone you love from the originals, of course, but it’s also a very sold standalone. It also features a bit of a mystery plot, with Bruce trying to figure out what the Nightwalker gang are up to. Madeline, refusing to talk and constantly locked in a cell in the asylum, gradually warms up to Bruce and they begin having a conversation. She was a stunning antihero, full of complex values and a good dash of danger. You can’t tell if she’s manipulating Bruce or she really cares about him. He ends up caring quite fiercely about her, despite knowing she’s part of a murder-gang. Because is she everything she appears to be? Bruce himself was was a winning character that you definitely want to root for. Although, I’ll be honest, he’s basically a textbook Gryffindor, full of reckless bravery and a hunger for justice and fairness. He’s completely in love with the idea that the world can be better, but he goes about doing it in usually the wrong way. Which is great! Because that’s the teenage life! He like sees a person and he just gotta save ’em. He’s obviously extremely privileged and rich but he also was keen to not let that have him lead a spoiled or blinded life. I liked seeing familiar names appear. Like Harvey Dent is in there and Gorden is mentioned. And then there’s Alfred, the light of the world. He’s the perfect mix of father, butler, and teacher with a side-dish of tea and British disapproval. He tells Bruce to slow down while driving and makes him breakfast and says he has 0% sympathy when Bruce does something stupid. Alfred is amazing! Batman Nightwalker is definitely a fun addition to this DC Icon series! It’s not super dark, but it has a lot of twists and it’s great seeing how Bruce would grow up to be the man bat he is today.